One particular factor that truly enhances the US ability to provide airborne strike and defensive capabilities is mid-air refueling. This not only extends the abilities of aircraft to stay in the air, but vastly improves their operational range. The USAF in particular has concentrated on having a fairly decent fleet of air refueling aircraft. This started with the KB-29, then the KC-97, the KC-135 and then to the KC-10. This latter aircraft very much enhances the still fairly large batch of KC-135s still flying as it not only holds more fuel but has a greater range. 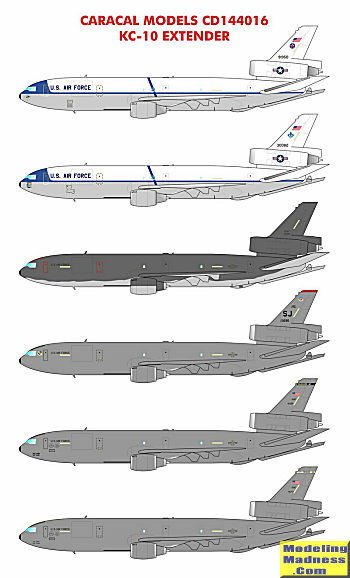 This air refueling capability, like the KC-135 still leaves considerable space for cargo if needed. However, unlike the KC-135, the KC-10 is also able to refuel USN aircraft using wing pods with a hose and drogue system. So far, the type is expected to stay in service until 2043. This particular Caracal Models sheet is for the Revell kit of the KC-10, a kit that has been generally unavailable for several years. A google search did not turn up a single example for sale. This either means that a lot of people have the kit and want options or that Revell is scheduled to re-issue it. The sheet covers all three camouflage schemes with the first two in the old 'white top', the next in the 'Shamu' scheme and the final three in the current AMC grey. 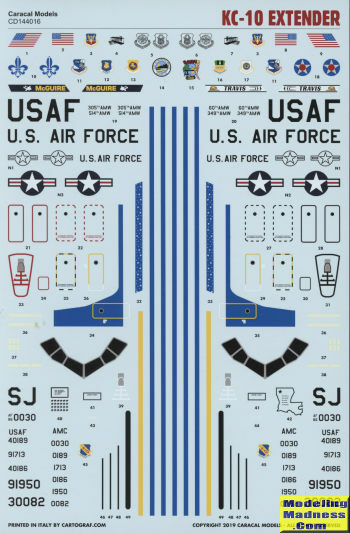 If you choose wisely, there are enough common markings on the sheet to do two aircraft and this includes the blue cheat line for the early plane though you'll have to paint a portion of this area. The decals themselves are superbly printed by Cartograf.